There’s a new podcast app on the block. Its called Overcast and its the brainchild of an App Store developer veteran Marco Arment. Marco is the co-founder of popular micro-blogging site Tumblr and the creator of read-it-later app Instapaper. Chances are you’ve heard of his work. with Overcast, Arment sets his sights on correcting all that he thinks is wrong with podcast apps. Yet there is one big reason Overcast matters. It is a free and enormously better alternative to Apple’s podcast app. That means that casual podcast listeners can finally get a beautifully designed, functional app with no initial cost of entry. That being said, Overcast does offer some sweet advanced features via in-app-purchase for those wishing to expand the app’s functionality. 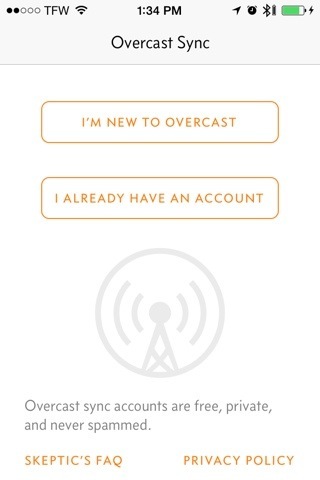 When you launch Overcast for the first time, you will be asked to create an overcast.fm account. This will be used to sync your settings and subscriptions. You’ll also be able to visit the website in any browser to play your podcasts. Once inside the main screen you can quickly add a new postcast by tapping the + button in the upper right corner. 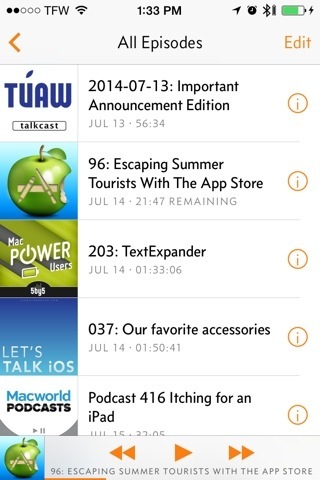 Then you’ll be able to browse sorted categories, search the podcast directory, or add a podcast via URL. Once a podcast is chosen, the most recent episode will start downloading and you will be automatically subscribed to future episodes. You can change that by tapping the podcast and adjusting the settings. If you’d like to listen to your shows in a particular order, just head to the main screen and create a playlist. While on the main screen you’ll also be able to tweak some of the app settings like forward and backward skip time intervals. Playing an episode puts the artwork at the forefront with navigation controls underneath. 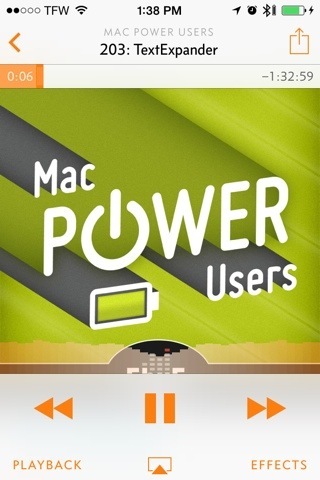 In a neat twist, Overcast displays a real sound equalizer overlaid on the artwork – not necessary, but a nice touch. More importantly, any time you’re out of the episode view, you’ll see which episode is playing at the bottom of the screen (a feature we love in Pocket Casts). This way you can simply tap on that now playing bar and just back into the episode view. Episodes can be shared with friends via the share button. These links will take them to the overcast.fm site for convenient listening. That’s the basic functionality of Overcast in a nutshell. However, if you’re looking for more advanced control of your podcasts, the optional in-app purchase unlocks some cool stuff. First up is Smart Speed. Have you ever wanted to speed up an episode but hated how the audio distorts as a result? Smart Speed takes a different route to save you some listening time. 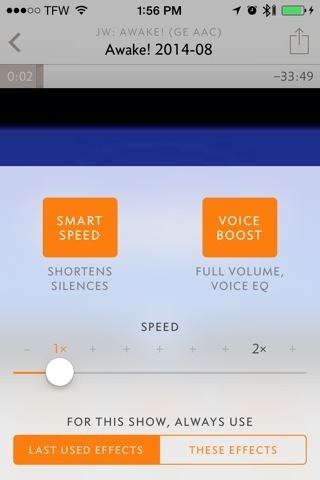 Instead of speeding up the audio, Overcast will “smartly” trim out mid to long range pauses in the dialogue. Smart Speed works so well, you probably won’t even realize the time you’re saving. For those that want traditional speed settings, Overcast offers them too. Another welcome advanced feature is Voice Boost. I hate it when two podcasters are conversing at different volume levels. I’ve written in to shows asking that all participants adjust their mics to the same input levels. But Voice Boost renders this a moot point. All commentators voices are automatically adjusted to a comfortable level. I’d say these two features alone make the in-app-purchase worth it. But if that wasn’t enough, a sleep timer is also included in the purchase. Recently, Marco Arment, the developer has now released Overcast for Apple Watch. It’s the best podcast player for Apple Watch.